Contr. Univ. Mich. Herb. 5: 49. 1941. Cap 2.5-4.5 cm broad, conic, becoming broadly conic to campulate in age; margin striate, decorated with evanescent white veil fragments; surface obscurely fibrillose, glabrous in age, hygrophanous, brown, to dull mustard-brown, fading from the disc to buff-brown, pallid or whitish at maturity. Flesh, thin, pallid, fragile. Gills, close, adnate, narrow, pallid at first, dark-brown to blackish-brown in age, the edges lighter. 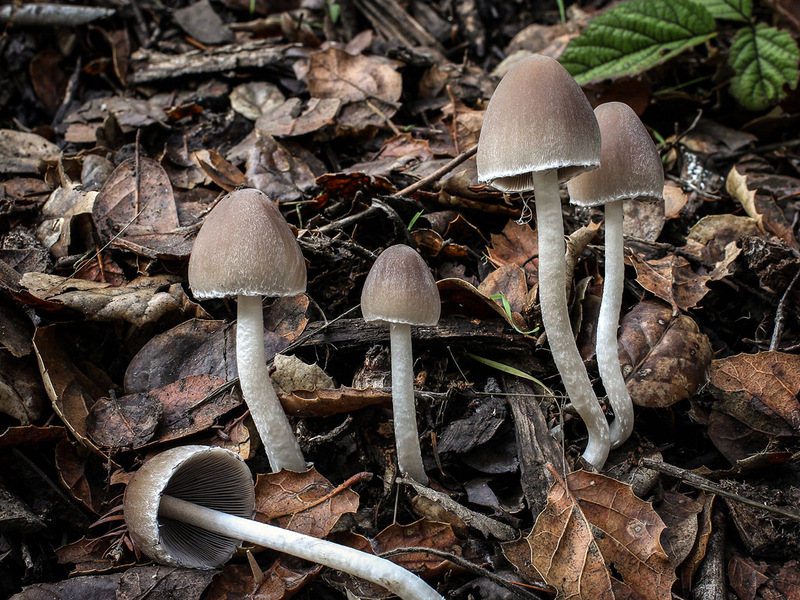 Stipe 6-12 cm long, 3-6 mm thick, fragile, hollow, straight, equal; surface smooth to patchy fibrillose, pallid, with pubescent mycelium at the base; veil evanescent, cottony/membranous, leaving white fragments on the young pileus. Spores 10-14 x 7-9 µm, elliptical, smooth, with an apical germ pore, nonamyloid; spore print dark-brown to blackish-brown. Solitary to scattered in leaf litter and well decayed woody debris, under both hardwoods and conifers; fruiting from after the fall rains to late winter. 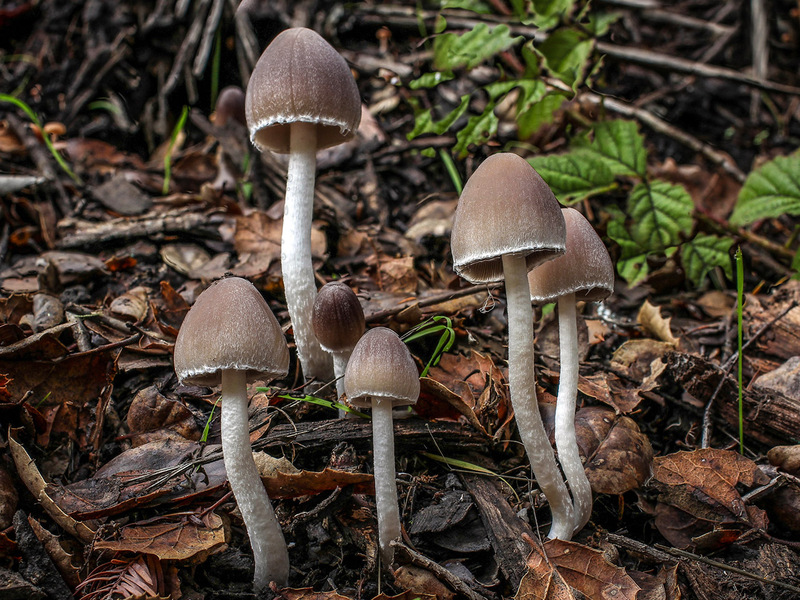 In a group of drab, undistinguished fungi, Psathyrella longipes is an attractive, albeit fragile exception. 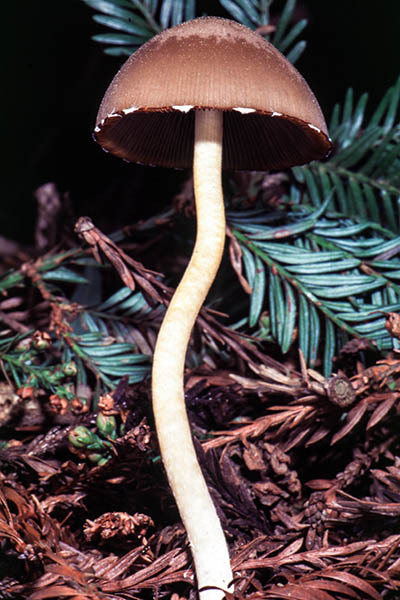 The relatively large, broadly conic, hygrophanous cap with an appendiculate margin and "leggy" stipe help to separate this mushroom from most related Psathyrellas. Psathyrella candolleana is also appendiculate, but has a convex cap at maturity, and is more robust in stature. 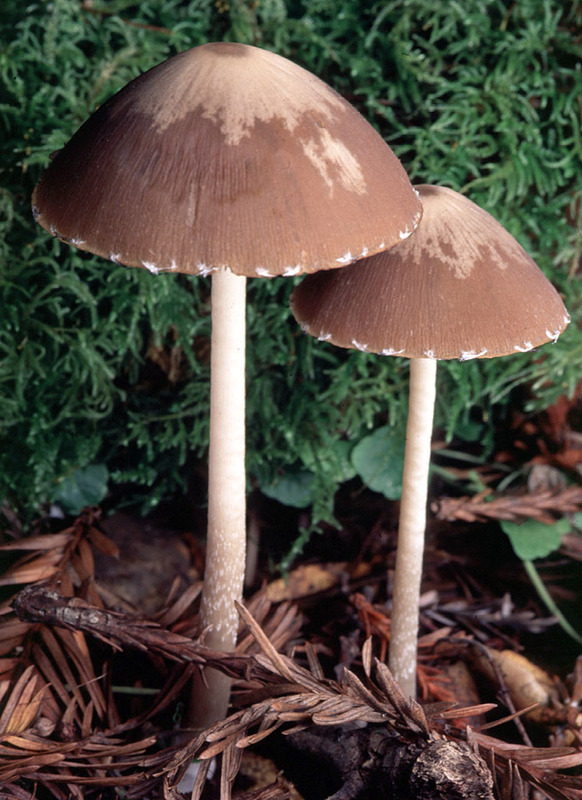 Psathyrella hydrophila differs in its clustered habit, usually at the base of hardwood stumps, and has a convex cap. 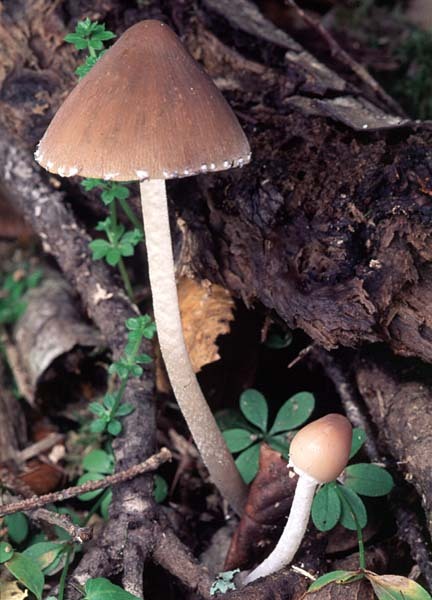 Finally, our most common Psathyrella, P. corrugis is smaller, and young caps are not normally appendiculate. Parker, C.S. (1933). 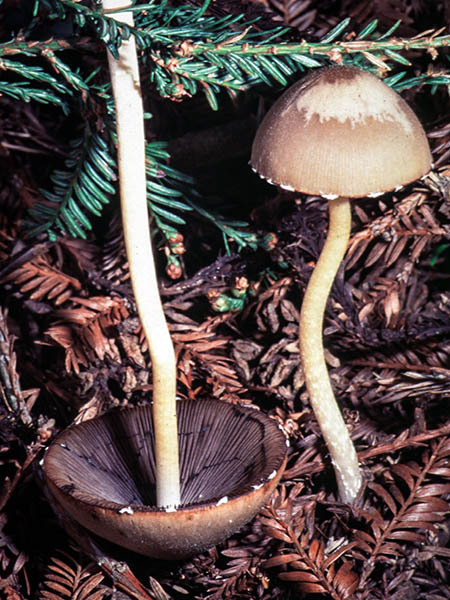 A Taxonomic Study of the Genus Hypholoma in North America. Mycologia 25(3): 160-212. Smith, A.H. (1941). Studies of North American Agarics—I. Contr. Univ. Mich. Herb. 5: 5-73. Smith, A.H. (1972). The North American Species of Psathyrella (Mem. NY. Bot. Gard. : 24). New York Botanical Garden: Bronx, NY. 521 p.